Sauerkraut sounds an unlikely local product – but cabbage grows well round here even up on the tops, and sauerkraut is a traditional way of preserving it, by shredding and fermenting with salt. 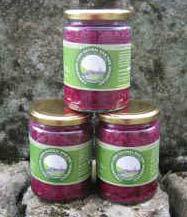 Sally Hayes of Crimsworth Farm Products in Pecket Well above Hebden Bridge has just started producing raw pink sauerkraut. It's different from the rather bland sauerkraut commonly available in supermarkets because it's crunchier, low salt, with added ginger and is a lovely bright pink (because it's made with both red and white cabbage). The fermentation process leads to the generation of probiotic bacteria very beneficial to the digestive system. Modern research has indicated that a healthy digestive system is central to a healthy body and an active immune system. 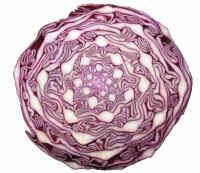 Sally told the Hebden Bridge Web, "We recently discovered the considerable health benefits of sauerkraut, and how nice a raw organic crunchy version tastes. We experimented with different recipes until we settled on one we are happy with. Our Sauerkraut has less than 1% salt, is high in fibre and vitamin C and being unpasteurised is full of naturally occurring enzymes, as well as the pro-biotic bacteria which is so good for you. Our aim is to supply a product that is full of health-giving properties which uses mainly local organic ingredients, thus ensuring a low carbon footprint." There will be free taster sessions of the new product at Valley Organics (Market Street, Hebden Bridge) and at The Bear (Rochdale Road, Todmorden) on Saturday 12th May. Crimsworth Farm is an old Yorkshire farmhouse in Pecket Well, about 1,000 feet up and fairly open to the wind and weather. We have been here for 8 years, gradually expanding our vegetable garden and becoming more self-sufficient. Cabbage grows well here, with the aid of compost, manure and lots of tender loving care! We'll be using our own cabbage in the sauerkraut where possible. See www.crimsworthfarm.co.uk for more information.